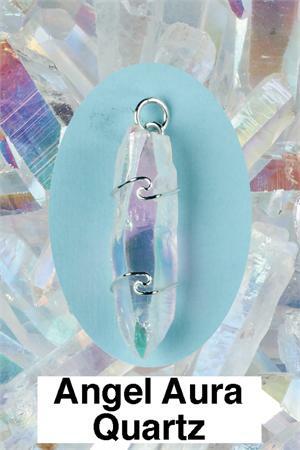 Angel Aura Quartz pendent wrapped with silver wire. As these are natural products stones vary in shape and finish, all pieces are 1cm in size approx. Mystic Lore: Intuitive sources say Angel Aura Quartz helps bring one into the higher realms in meditation, facilitating conscious contact with angels, spirit guides and inner realm teachers. It is said to assist one in acessing the akashic records, channeling higher knowledge, remember ing past lives and gaining insight into one's spiritual mission in this lifetime. The metaphysical properties of Angel Aura Quartz have come from people’s intuition. You must use your own discrimination as to what is right and appropriate for you and your awareness.